The transition from parchment to paper as the preferred writing surface happened slowly in the Byzantine Empire. James Freeman outlines this process and addresses some of its key features. 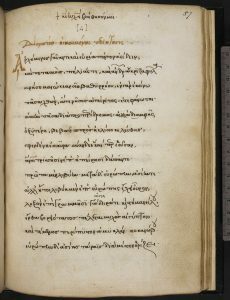 In the 12th century, a poet by the name of John Tzetzes lived in Constantinople. 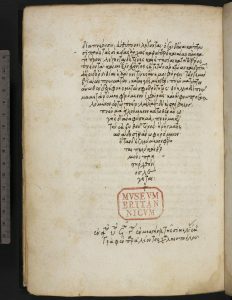 During his life, Tzetzes wrote a number of commentaries or scholia (explanatory notes) on classical literary works, such as the play Frogs by Aristophanes (c. 446 BCE–c. 386 BCE). 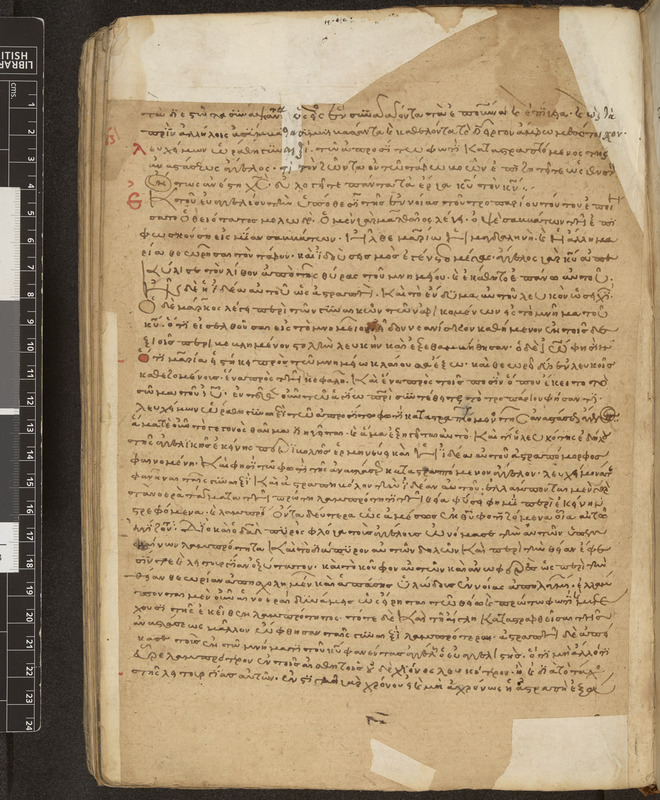 In a comment on line 843 of Frogs, Tzetzes complains that writing material (τους χάρτας), which may mean either parchment or paper, is in short supply. Comments similar to those of Tzetzes also appear in letters and works by other Byzantine scholars. Surrounded now by paper and the printed word, it is difficult for us to imagine such a world. 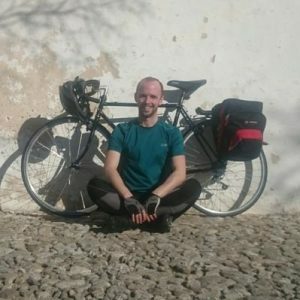 If it was hard to obtain in one of the major urban centres and trading hubs of the Mediterranean, it must have only been more difficult in the countryside. Yet for most of the medieval period, the craftsmen who made books, as well as writers and scholars like Tzetzes, struggled with this problem. It was only with the boom of Western, Italian hand-made paper in the 15th century that such scarcity was alleviated. This dilemma gives some idea of why paper was one of the most important technological innovations of the medieval world. What do we know of its origins, how it was made and traded, and how it was used? The explicit facts are as scarce for us as writing material was for John Tzetzes. Little documentary evidence survives of the processes or personnel involved in book production in the Byzantine Empire. What information we do possess has mostly been gathered painstakingly from the surviving books themselves. On the subject of the making and use of paper, much about the date and location has had to be inferred from ancillary information: the style and date of the handwriting or decoration (or both) in manuscript books, occasional scribal or artistic colophons, internal textual evidence (such as mention of particular events that demonstrates the book or document must have been made at a specific date or before, after or within a certain period) or signs of ownership by named and known individuals. A few broad facts are clear, however. Paper was in use far earlier in Byzantium than in Western Europe. It came to supplement – and ultimately to supplant – the role played previously by parchment alone. In Byzantium, it appears mostly to have been imported, rather than produced locally. Paper of a distinctive style of manufacture came first from the East, before being overtaken by Western-made paper. By the 15th century, both Byzantine and European markets came to be dominated by Italian-made paper. While parchment retained its prestige status and was known to be more robust, the particular appeal of paper was common to both regions: it was cheaper, more versatile and more widely and readily available. Examples from the British Library’s collections illuminate these matters further. Originally invented in China, paper spread first to Arabian markets in the second half of the 8th century. 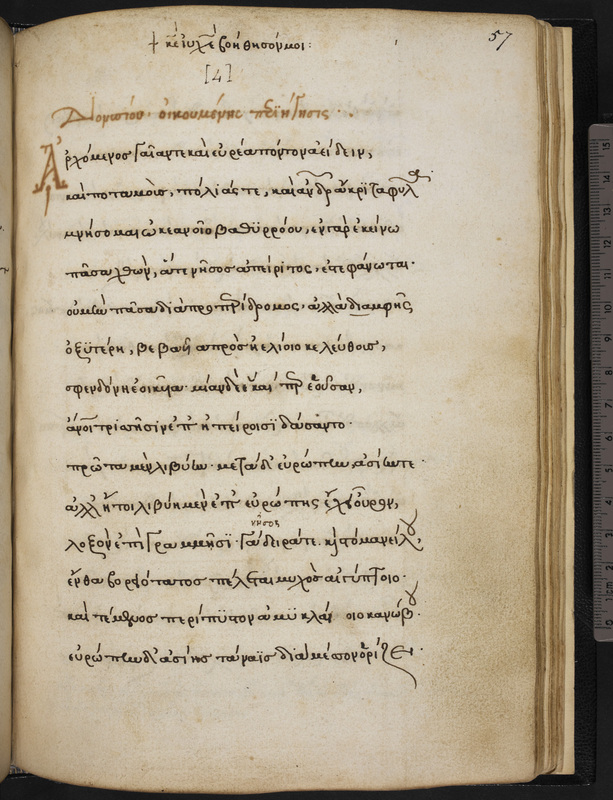 The very earliest manuscript written in Greek on paper was made around the year 800. 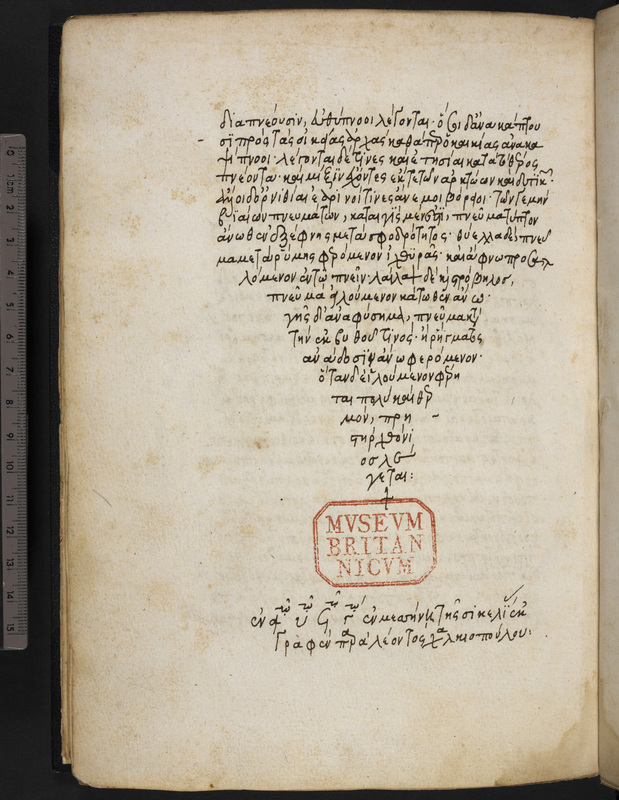 However, having been made in the Arab-dominated East, possibly in Damascus, this manuscript is something of an exceptional case (and more illustrative of the spread of Greek eastward rather than of paper westward). Paper had gained wide usage in this region when it became the compulsory material in the secretariat of the Caliphate at around the same time as this book was made. Paper may have reached Byzantium as early as the 9th century, when a tax called the chartiatika (χαρτιατικά) was introduced; there are also references to ‘paper makers’ or chartopoioi (χαρτοποιοί), and such individuals are recorded in the first quarter of this century in the monastery of Stoudios, where a large scriptorium was located. 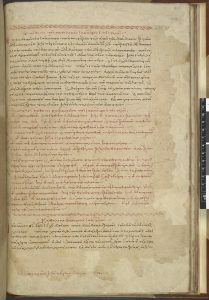 It is in the 11th century though, that material evidence begins to proliferate, with the earliest Greek documents on paper dating from this period. 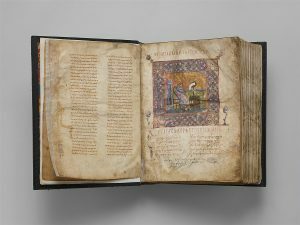 The material evidence that survives – whether Byzantine, Syriac or Egyptian books or documents, written in Greek or Arabic – indicates only slight variations in the techniques of paper manufacture between its first introduction to Byzantium and the close of the medieval period. From microscopic analysis of the fibres of surviving examples, we know that paper could be made from a variety of materials, the two main types being fibrous plant matter and linen rags. In late medieval paper manufacture, the raw materials were first sorted, washed and left to decompose slightly, then shredded, pulped and rinsed, before being diluted with water and heated in a large vat. The paper-maker (or ‘vat-man’) used a large wire sieve (or ‘mould’) that slotted into a wooden frame (or ‘deckle’), which he dipped into the vat to catch some of the pulp. Emblems made of wire were stitched onto the moulds; a vast array of designs has been recorded, including coats of arms; animals of every sort; human hands or heads; everyday objects such as weighing scales, scissors, keys or bells; initials; flowers; stars or suns; and many others. These designs left watermarks on the finished paper that could identify the place of origin or manufacturer. Once the pulp had been spread over the whole surface of the mould and the excess water had drained away, the mould was removed from the deckle and given to the coucher (pronounced ‘koocher’), who turned out the wet paper onto a sheet of felt. The process was repeated, each layer of paper separated by a layer of felt. The whole pile was then placed under a hand-press, in order to squeeze out the remaining water. Once separated from the felt sheets, the paper was hung up to dry before being treated to make the surface less permeable. Known as ‘sizing’, this involved dipping the sheets into hot animal glue. The paper was then pressed and dried once more, and its surface smoothed (if it was to be used for writing). In Byzantium, two words were often used to describe books made of paper – bagdatikon(βαγδατικός– ‘of Baghdad’) and bombykinon (βαμϐύχιυος – ‘of Mambydsch’?) – both indicative of the material’s arrival from near-Eastern markets (although some paper from Arabic centres in the West has also been identified in Byzantine manuscripts). ‘Bombycine’ paper was used in Byzantium from the mid-11th century. It gained very wide documentary use from an early stage, being used almost exclusively by the Empire’s bureaucrats as well as private individuals in the 11th and 12th centuries (with the exception of Macedonia, where parchment was always preferred). It has been easier to chronicle the use of bombycine and other types of paper in documents and letters, since these usually either contain dates or information that enables scholars to narrow down when they were produced; its use in books appears to have undergone similar fluctuations. 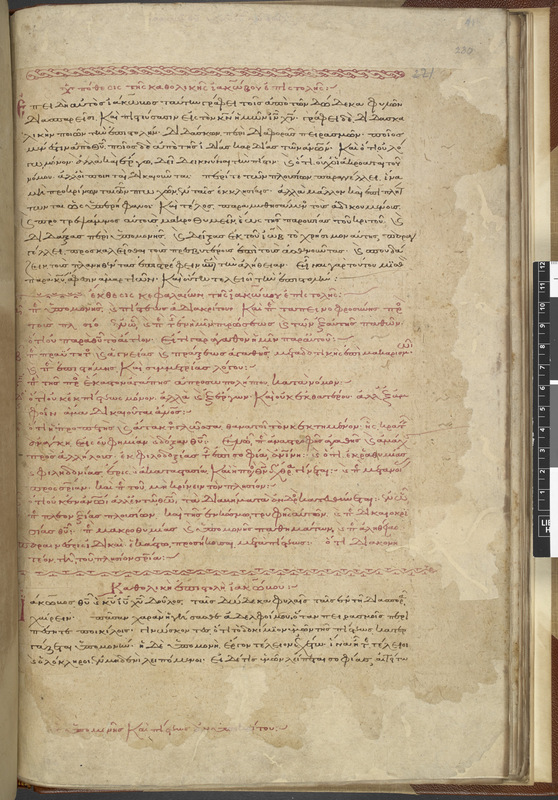 Many Greek manuscripts at the British Library were made using bombycine paper. 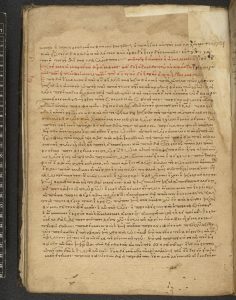 One of the earliest among them is Burney MS 48, a two-volume copy of the Commentaries of St John Chrysostom on the Pauline letters, followed by the Catholic Epistles, which dates to the 11th/12th century. Examples of bombycine paper share some common characteristics: the pulp is of even consistency, the paper is of brownish colour with a smooth and almost shiny surface, and there are no watermarks present. During the 13th century, parchment underwent something of a revival, before paper came to dominate once more in the next century. 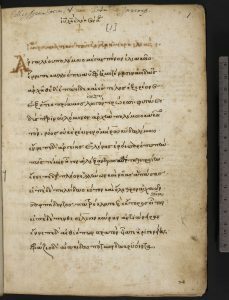 By that time, however, Western, Italian-made paper had long been imported into Byzantium; the earliest dated Greek manuscript on Western paper at the British Library is from 1252. While bombycine paper continued to be used until the 15th century, it was increasingly superseded by this new alternative. Western paper was paler in colour than bombycine, yellowish and sometimes nearly white. While in early examples the surface was often rough, and the pulp irregular, over time the manufacturing techniques became more refined, and thinner and more even sheets of paper began to be mass-produced. A key difference was also the presence of watermarks: although appearing fitfully in paper produced during the last years of the 13th century, they became a standard feature from the beginning of the 14th century. They have been used by scholars to date samples of paper, or identify its place of production. 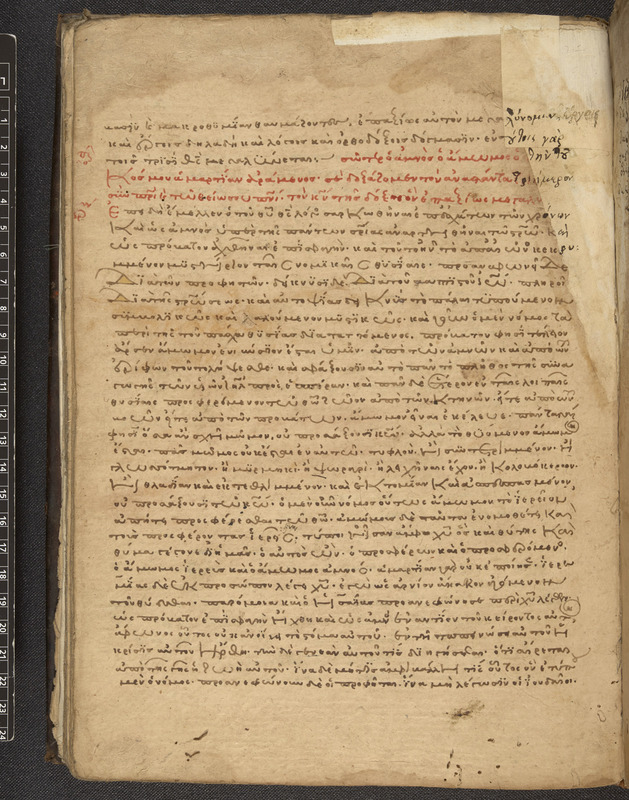 Clearly, when a Byzantine scribe came to make a book, the choice between parchment and paper was not straightforward; it was a decision informed by many factors. 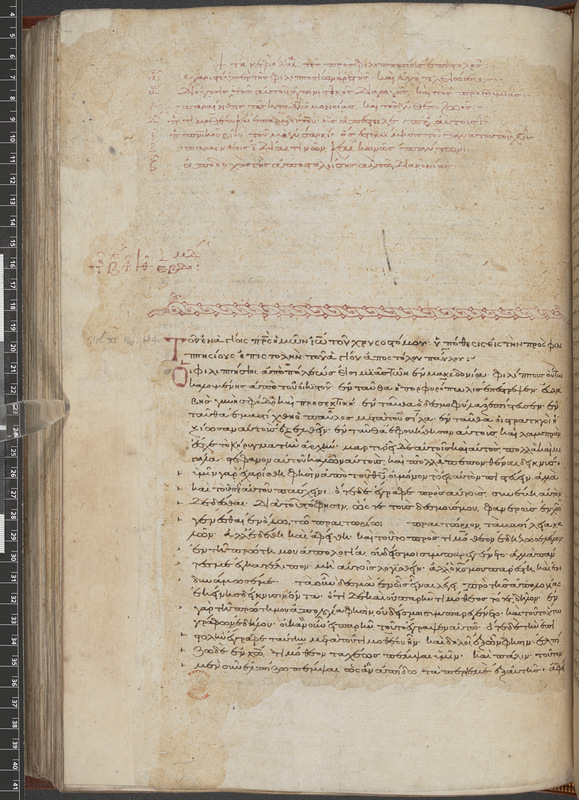 Patriarch Gregory II of Cyprus (1241–1290) complained in a letter that he could not have a volume of Demosthenes made until spring, when people would begin to eat meat once more and animal skins be made available for parchment-making. Paper was widely available by that point; why did he not use that instead? In Byzantium, as in Europe, parchment remained more expensive than paper, and retained prestige associations that paper never assumed: it had been used for centuries, was longer-lasting, and was the material used to copy the very best and most luxuriously decorated (often religious) books – perhaps the kind of book desired by an important figure like Gregory. Its supply naturally fluctuated, although that of paper (being imported) must too have been influenced by disputes or conflicts along trade routes or failed mercantile expeditions. Being hand-made products, the quality of both will have varied, depending on the skill of the craftsmen responsible or the health of the animals or the fineness of the raw pulp. Paper may have been used out of necessity: if nothing better was available, or nothing else could be afforded. It may have also been used out of choice: it was cheaper, easier to obtain, and was the functional option. 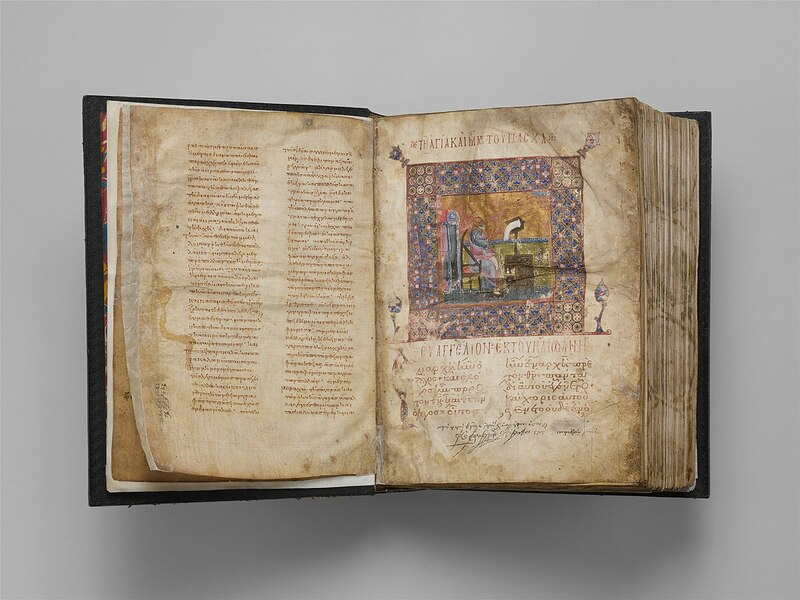 When we first examine a medieval Byzantine manuscript, we can learn much about the costs of production, the means of whoever produced or acquired the book, and aspects of its intended use from consideration of the leaves on which the text was written. This entry was posted in Art History, Byzantine, Byzantium, History. Bookmark the permalink.